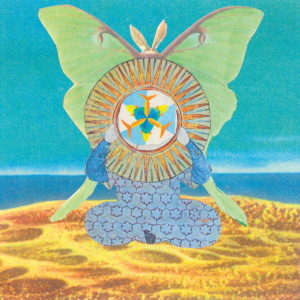 “The Jingling World of The Skygreen Leopards” is a collection of songs from the first two Skygreen Leopards CDRs on Jewelled Antler; two mini albums written & recorded in the distant days of 2001, a year with a name that evokes a psychedelic future but which now seems very much part of the psychedelic past. Guided by Tall Dwarfs, The Monkees & The TVPs, the early SGLs concept was to mix automatic songwriting, two voices, California 12-string and put it on reverb smothered 1/4″ tape. The restrictions were that no songs could break the 3 minute mark, no jamming allowed, and you never went back to fix mistakes. All songs were written and performed by Glenn Donaldson and Donovan Quinn; both switching instruments and overdubbing until Glenn’s Tascam 388 had run out of open tracks. From the womb of fanzines, flea market record crates of the 90’s and San Francisco’s fading victorians, it’s “The Jingling World of The Skygreen Leopards”!